Long Island children's events, kids programs, children activities, children's festivals, kids workshops and children's event planning in Nassau County, Suffolk County, Long Island New York. Southampton Youth Bureau Studio 655 Music Arts Program For Children In Grades 5-12 at The Drop Spot in Flanders, Suffolk County, Long Island, New York. Southampton Youth Bureau Teen Community Theater Act Two 2018 at Hampton Bays Public Library in Hampton Bays, Suffolk County, Long Island, New York. Amerikids: Arts Crafts Homework Help Building Social Skills For Children Grades K-4 at The Drop Spot in Flanders, Suffolk County, Long Island, New York. Southampton Youth Bureau Homework Help For Children Tuesdays at The Drop Spot in Flanders, Suffolk County, Long Island, New York. Southampton Youth Bureau Chess Club For Children Grades K-12 at The Drop Spot in Flanders, Suffolk County, Long Island, New York. Southampton Youth Bureau Youth Advisory Committee Registration at Hampton Bays Community Center, Hampton Bays, Suffolk County, Long Island, New York. Southampton Town Youth Court Youth Court Registrations 2018 at Southampton Town Justice Court in Hampton Bays, Suffolk County, Long Island, New York. 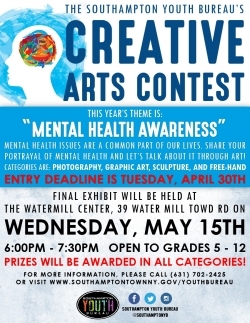 Southampton Youth Bureau Creative Arts Contest: Mental Health Awareness at The Watermill Center in Southampton, Suffolk County, Long Island, New York.